If your idea of a cabin is an elegant home for family living and entertaining, The Peekskill is for you. A stunning center dormer with arched window embellishes the exterior of this Craftsman style home with walkout basement. The home offers an attractive and beautiful angled floor plan that provides an inviting courtyard setting. The dormer's arched window allows light into the foyer with built-in niche. The second floor's hall is a balcony that overlooks both foyer and great room. A generous back porch extends the great room, which features an impressive vaulted ceiling and fireplace, while a tray ceiling adorns the formal dining room. The master bedroom, which has a tray ceiling as well, enjoys back porch access, a built-in cabinet, generous walk-in closet, and private bath. 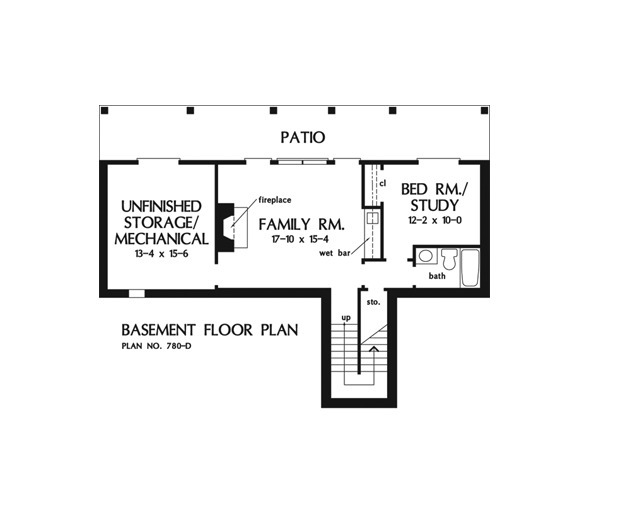 Two more bedrooms are located upstairs, while a fourth can be found in the basement along with a family room. Note the huge 575 sq. ft. bonus room over the three car garage. 1st Floor: 1662 Sq. Ft.
Porch - Screened: 97 Sq. Ft. Bonus Room: 575 Sq. Ft.
Other Storage: 244 Sq. Ft.
House Dimensions: 81' 4" x 68' 8"
Bedroom / Study : 12' 2" x 10' 2" x 9' 5"
Bedroom #3 (Clipped): 11' 8" x 12' 4" x 8' 0"
Bedroom #4 (Clipped): 11' 8" x 13' 0" x 8' 0"
Porch - Front : 22' 2" x 7' 4" x 0' 0"
Porch - Rear : 35' 5" x 6' 10" x 0' 0"
Porch - Screen : 9' 4" x 9' 0" x 0' 0"
Deck / Patio : 48' 4" x 6' 10" x 0' 0"
Balcony : 21' 0" x 3' 8" x 8' 0"
Storage (Other) : 13' 4" x 15' 8" x 0' 0"
Storage (Bonus) : 3' 4" x 6' 8" x 0' 0"
Other : 17' 10" x 15' 6" x 9' 5"
Foyer (Cathedral): 6' 4" x 7' 4" x 23' 4"
Dining Room (Tray): 12' 0" x 15' 0" x 10' 5"
Great Room (Cathedral): 21' 0" x 16' 0" x 23' 4"
Kitchen : 8' 8" x 13' 2" x 9' 0"
Utility Room : 8' 4" x 5' 8" x 9' 0"
Bonus Room (Cathedral): 12' 8" x 41' 0" x 8' 0"
Garage : 22' 0" x 34' 0" x 0' 0"
Garage Storage : 5' 0" x 2' 0" x 0' 0"